“Spiders Aren’t Animals!” Well, Actually…. Over the years, literally hundreds of people have told me that spiders are not animals. This seems to happen the majority of the times that the topic of spiders comes up in conversation. When I reply that spiders are, in fact, animals, the usual response is “Spiders are insects!” This gives me headaches, because (1) spiders aren’t insects, and (2) insects are also animals. Spiders happen to be my favorite animal, so this is quite confusing to me. Hopefully, this screenshot from my Google-search for “animal definition” will help spread the word that spiders are, indeed, part of the animal kingdom. Since I like spiders, I was pleased to read a rough estimate of 21 quadrillion for the world’s population of spiders (source: here). The website http://www.worldometers.info/world-population/ gives the current human population as ~7.4 billion. Dividing the estimated spider population by the estimated human population yields Earth’s estimated spider-to-human ratio: 2.8 million. Yes, your share approaches three million spiders. At least they are good at taking care of themselves! In the future, the human race, homo sapiens, will do what all living organisms do when circumstances change, as they always do, sooner or later. We will adapt, migrate, and/or die. Since this is a post about speciation, I’m mentally setting that part of my brain which worries about extinction happening relatively soon to “hopeful,” for the duration of writing this post. For speciation to happen, two things must happen first: reproductive isolation, and the passage of a lot of time. Migration (to off-earth colonies, for example) can produce reproductive isolation, but so can other things. As for adaptation, this is done in many ways by our species, consciously, as well as unconsciously. Evolution is always happening, but it is the slowest of all human adaptive processes. It is estimated that it has taken us (and everything else) 3.85 billion years to evolve, after all, and that’s roughly the most recent third of the time since the Big Bang. 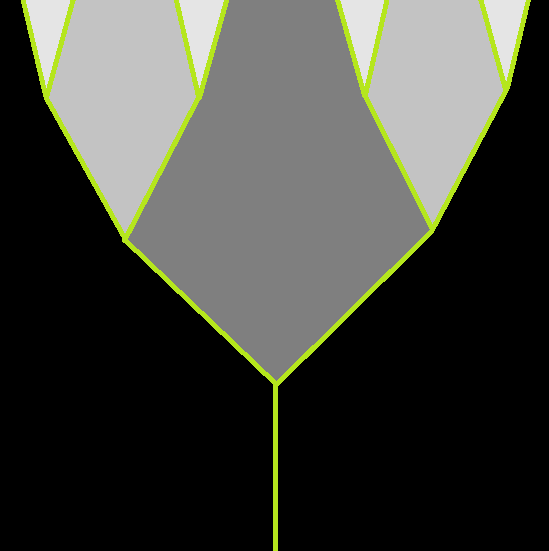 Extra-terrestrial colonies would definitely be a huge “push” toward speciation, especially colonies with low gravity, relative to that experienced by other people. As well-described in Robert Heinlein’s novel The Moon Is a Harsh Mistress, return to a high-gravity environment, after many years in a low-gravity environment, would carry significant health effects, with serious risks of sever complications, up to, and including, death. If we ever establish colonies outside the solar system, this isolation will become even more extreme, simply due to the enormous distances and travel-times involved. However, we will speciate, as will all other species, if we stay alive long enough, even if no more of us leave low-Earth orbit. In my previous post on this subject, I speculated about the emergence of fully-speciated homo lunaris, homo literaticus, homo illiteraticus, artificially-genetically-modified humans (whom I did not name then, but homo techogeneticus would do nicely), and homo cyberneticus. An increase in the number of infertile offspring between two groups, combined with a falling birthrate between them, persisting over millennia, would be an early warning signal that speciation might be happening — that’s how long this evolutionary process takes. Given enough time, and increased reproductive isolation from non-“Aspies,” another group which could speciate is the population with Asperger’s, to form homo aspergerus, primarily because of the difficulties each group of people have communicating with the other group. However, I’ve written several posts already which seek to help Aspies and non-Aspies understand, and bridge, the communication-gap. What’s going on here? Simple: evolution is simply a process which happens. It has no ethics. It is neither good nor evil. More to the point, just because I can discern a possible future does not mean I want that possibility to become real. In what other ways could speciation happen? A widenining gap between the rich and poor certainly seems possible as a “push” towards speciation, at least currently, which could create homo plutocraticus and homo povertus. It is easily possible to imagine this happening along with the emergence of homo cyberneticus. Another interesting possibility would occur if humanity survived in the North and Southern hemispheres, near the poles, but extreme global warming made tropical regions uninhabitable, and the equator untraversable, or at least very rarely crossed. In this case, it is hard to imagine what direction the changes would take, for they could go in many directions. Names for such Northern and Southern humans could be homo borealis and homo australis, from our point of view. 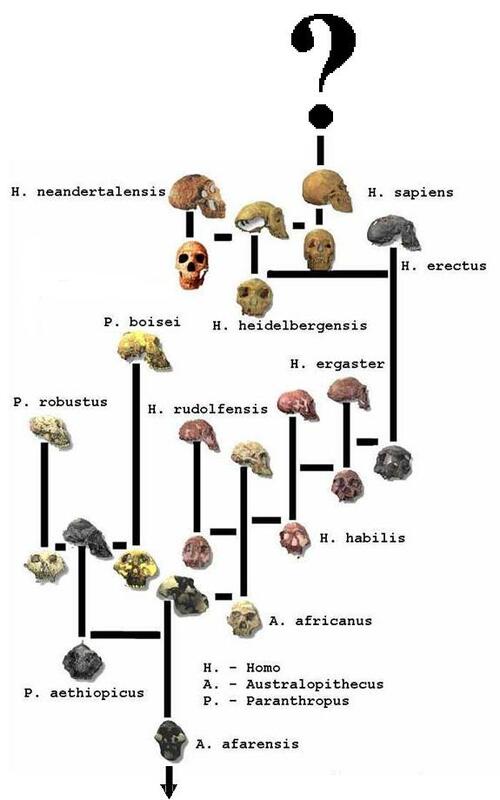 In theirs, of course, as in many of these scenarios, the likely terms each group will use for the other will translate, roughly, as “us” and “them,” unless they somehow manage to shed the primate characteristic of forming rival groups, one which long predates humanity. How could the maximum number of new species emerge in the least time possible? This is known: a mass extinction would be needed, one which leaves a small (but large enough) percentage of humanity alive, and fertile. This would open numerous ecological niches which we, and other extant species, would rapidly fill, by rapid speciation, into an amazing variety of forms. Again, this simply happens — that does not mean it is to be desired, and I am certainly not hoping for it to happen soon. I simply realize that it has happened before, and we have no reason to think it will not happen again. 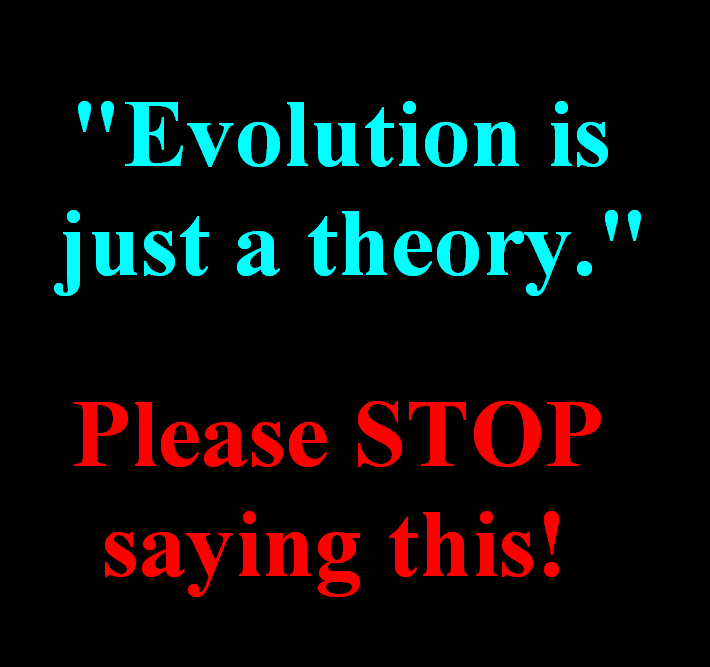 “Evolution is just a theory.” Please STOP saying this! 1. Germs are the cause of many diseases. 2. Everything you have ever touched is made of atoms. 3. The spinning earth doesn’t fling us into outer space because of gravity. Would any reasonable person actually think the phrase “just a theory” makes sense for any of these three things? Use of this phrase, for evolution, the Big Bang, or anything else, indicates one thing: the person talking does not understand the meaning of the word “theory.” Theories are the best science has to offer, and science is the foundation of modern civilization. These theories are based on the repeated testing of hypotheses, using experiment, to explain what we observe — so they are evidence-based explanations, not mere guesses, as the annoying phrase “just a theory” implies. Evolution is every bit as well-established a theory as the three examples cited above. All theories are subject to further testing, which is an important self-correcting mechanism in science. No theory is beyond revision or replacement, if new experimental evidence calls for it. However, that fact doesn’t make any particular theory invalid — it simply helps explain why science works. It also works just as well whether people believe in it, or approve of it, or agree with it — or not. If you want to disprove the theory of evolution, just find a fossilized rabbit in a one-billion-year-old rock, as J.M.S. Haldane famously observed. It will only take one such finding to accomplish your goal, and you can publish your results, and become famous – if you can find such a fossil. For your own safety, though, please do not hold your breath while looking. This just in from Longview, Texas — a five-meter (~16 foot) Burmese Python is on the loose. If you see it, do not approach. Also: learn the metric system.